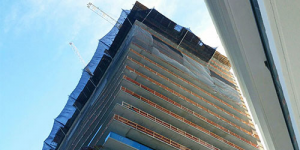 TSC Southeast provides safety solutions to construction sites including drop netting systems. This drop netting is useful for catching large debris that falls from buildings under construction to prevent it from landing on a person or property below. At TSC Southeast, we will work with you to design a drop netting system that fits the needs of your construction site. We understand that all construction sites are different which is why we will design and install a configuration that will maximize protection for your jobsite. Multiple nets can be connected together around the length of the building to catch falling debris from several floors. We will install the netting system on your jobsite with minimal disruption and downtime so that you can get to work quickly. On a construction site, having large debris falling from a high floor of a building can be deadly for unaware pedestrians walking below. Our drop netting is heavy duty and can catch large debris so that people underneath the area under construction will not be hit by debris. Drop netting systems are a useful way to protect people and workers from hazards on a construction site. TSC Southeast provides solutions to help keep your jobsite safe. We are a safety consulting company serving South Florida. Our trained personnel can install drop netting systems or other safety solutions on your jobsite in accordance with OSHA standards. We provide a wide variety of netting systems available to purchase, as well as staff to install and maintain the netting once it is assembled. If you are interested in preventing injuries and promoting safety, contact us today to learn more about our drop netting systems.